I have a selection of supports for my camera gear. All shapes and sizes, for all kinds of uses. Tripods that rarely see the light of day, monopods that for some reason have three legs but are still called monopods and those overpriced pocketable types with the flexible legs that flex to pieces. I wanted to get back to basics and find a simple aluminium monopod that suited my uses. I feel the Velbon Ultra Stick L50 is the very thing. Compact, light and stable. At 370mm collapsed and 1550mm fully extended (without a head) I was more than happy with it’s portability. I don’t like having my gear strapped to the outside of a bag as it tends to advertise what’s in the bag. This is small and light enough at 280g to slide in most camera bags or satchels. As light as it is, the specs state it will happily hold 2.5KG (that’s 5.52ibs in old money). 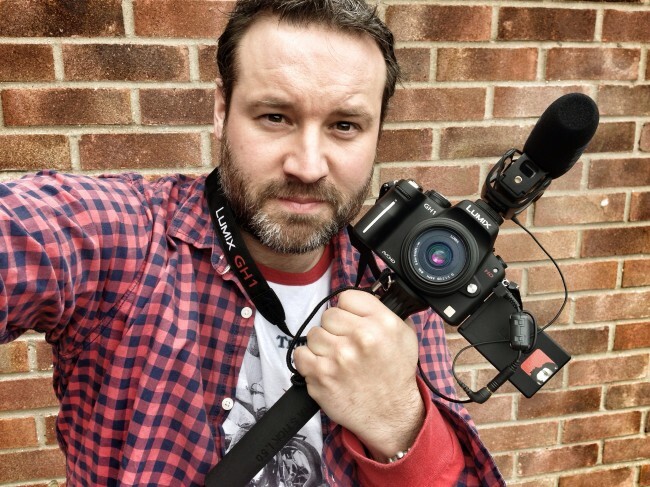 I’m currently using it with a Panasonic Lumix GH1 with mic and have no doubt it will happily cope with the newer larger Panasonic Lumix GH3 with battery grip, lighting and mic… when I can afford it. I paid less than £25 on Amazon and am including affiliate links in this blog should you feel like treating yourself. (It costs nothing extra to you if you purchase via the link but Amazon may send me a voucher for a few pennies if lots of people use it). Personally I think it’s a bargain. Although If I find it breaking in a few weeks or suddenly deemed an offensive weapon, i’ll be sure to pop back here and add that info to my blog. yes, more than one year later, I’ve got a question about this monopod. Do you think it will fit into a “Universal 3 Legs Monopod Base Stand Unipod Tripod Holder Support For DSLR Camera (ebay)” http://www.ebay.ca/itm/Universal-3-Legs-Monopod-Base-Stand-Unipod-Tripod-Holder-Support-For-DSLR-Camera-/231207119316?pt=LH_DefaultDomain_0&hash=item35d504a9d4#shpCntId. I am asking this question because the system of this monopod is quite different from others and I wonder if the end of the l50 has a screw 3/8″. Anyway. Thanks for your reply and your good review. hi, finally, I bought it. sturdy, strong, tall easy to develop, small & light, 270g, in the bag. I bought the L50 model better than the m50. thanks for the review.